Rent College Pads works to help college students at Auburn University find the best off-campus housing options near campus. Our listings feature apartments and houses for rent. Rent College Pads is your number one resource for Auburn off-campus housing. Finding apartments at Auburn University has always been a chore. At Rent College Pads we are fixing that. All of our off-campus housing options have been verified and approved by our diligent team of campus managers. We even follow up with you and the landlord to make sure you have found your perfect house. Because there are so many options to consider before making a responsible renting decision, check out our Auburn University University apartment hunting guide below. Eventually, the warm summer breezes will dissipate and Fall will be right around the corner. As a student at Auburn University, you should be mentally preparing yourself for this time of year, not only for the upcoming semester but the search for off-campus housing. Instead of putting off finding a place for yourself, you’ll want to start your search early in order to maximize your options. October and November tend to be the busiest search months for off-campus housing at Auburn, so don’t get left behind. Rent in Auburn varies depending on a number of factors. Houses tend to be cheaper than apartment complexes, but they often include more utilities and conveniences. If you want to conserve your money, we suggest living with a roommate or two. Rent prices for multi-bedroom units are significantly cheaper than single bedroom apartments, so if you need to conserve some cash, get some friends together and split the bill. Can't decide whether you're in the mood for Mexican or BBQ? You're in luck—the city of Auburn has a wide variety of dining options to satisfy your culinary cravings. Here are some common picks from students and their families. If you like to stay active and enjoy fresh air, Auburn is home to a number of outdoor activities that won't break the bank. Be sure to check out the Louise Kreher Forest Ecology Preserve & Nature Center, a beautiful outdoor area encompassing over 120 acres of woodlands. In addition, you can be involved in Auburn Outdoors, the University's outdoor learning and recreation program. Take advantage of the school-sponsored trips, equipment rentals and weekly events all centered around the great outdoors. There's no shortage of fun near the Auburn campus. To say that Gameday at Auburn University is a beloved tradition would be an understatement, and tailgating before a game at Jordan–Hare Stadium is a common weekend occurrence. If sports aren't your thing, Greek Life and extracurriculars are also popular at Auburn, so getting involved in other ways won't be tough. • Chewacla State Park: a 26-acre lake that holds a swimming area, campground, bike trails, and picnic areas. If you’re wanting to stick around for a night or two, you can rent out one of the six stone cottages located around the park. • Collins Smith Museum of Fine Art: this museum is one of the best in town, featuring collections that range from traditional to contemporary. With over 2000 pieces of art to see, it's well worth the trip. • Auburn Tigers Football Games: If you love football, be sure to get your tickets to see the Auburn Tigers play at Jordan–Hare Stadium. Tailgates, cheering fans, and school spirit are a few of the things you'll experience on game days. • Kiesel Park: if you’re a dog owner, this place may be the best spot for you and your pup. Kiesel Park is a large enclosed dog area where you can allow them to run around and get some exercise. There are many open fields, trails, and creeks that are open for exploration. Toomer’s Corner is the most notable landmark of Auburn at the intersection of College Street and Magnolia Avenue. The intersection is paved with bricks in the shape of the Auburn Tiger Paw. The cornerstone of the intersection is Toomer’s drugstore that gave its name to the area. It’s rumored that Toomer’s Corner Drugstore was the only place with a telegraph machine so residents of Auburn would await the news of an Auburn football victory to party at the intersection. 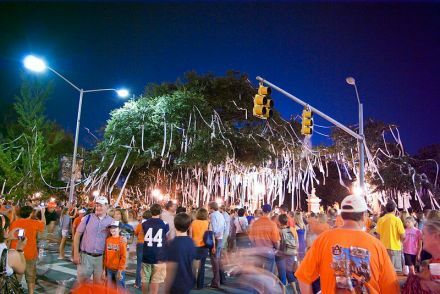 Toomer’s Corner has been the corner of Auburn’s campus since 1856. Toomer’s Corner drugstore has been a landmark since 1896 with its various popular flavors of lemonade. In 2010 an Alabama fan poisoned the oaks on Toomer’s corner killing all of the trees. The community rallied and since Auburn football fans “Roll The Corner” after every win. Rolling the Corner is a large celebration at the intersection with throwing toilet paper over the newly planted trees. Auburn now sits on land that was opened to settlement in 1832 by the treaty of Cusseta. The campaign for settlement was led by Judge John J. Harper with the intentions to create a higher education institution. In 1856 the state legislature chartered a Methodist college call the East Alabama Male College that opened its doors in 1859 to the now Auburn University. In 1892 the college became the first 4-year institution to admit women in the state of Alabama. In the midst of World War 2 Auburn’s campus was used to train technical specialist for the armed forces. After the war, Auburn Universities enrollment soared with attendance of returning soldiers on the GI Bill. 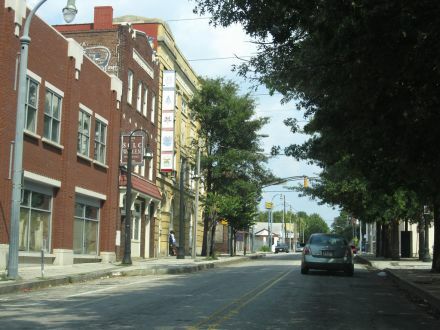 The city was very dependent on Auburn University for jobs and residents so the city of Auburn enacted initiatives to remove its dependence in the 80’s. This gave a surge in Industrial jobs and rapid residential growth. With such recent residential growth, Auburn’s main political issue is centered around finding a solution for the growing urban sprawl.